GloZell Lynette Simon is an Orlando, Florida-born American comedian as well as a YouTube personality, better known by her stage name “GloZell Green”. 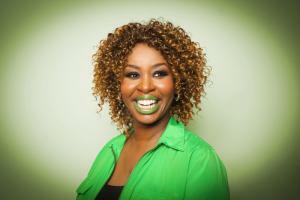 Born on 30th July 1972, GloZell has African-American heredity. One of the well-known internet icons at the present, she is very active on YouTube via her video channel, which she established in 2008. An iconic internet personality who has managed to gather more than four million subscribers to her YouTube channel, one may wonder how rich GloZell is, at the present? As estimated by sources, GloZell counts her net worth at an amount of $500,000 as of mid-2016, which she has managed to amass being a successful online personality and an entertaining comedian. She has also made appearances on television and is on the verge of working in Hollywood. Raised in Orlando, GloZell studied musical theatre, and graduated in 1997 from the University of Florida with a Bachelor of Fine Arts degree. She soon moved to Hollywood to pursue her dream as a comedian, and started working with The Groundlings, an improvisational and sketch comedy troupe. As a part of the group, GloZell attended 600 consecutive tapings of “The Tonight Show With Jay Leno”, where she got to watch her favorite comedian, Jay Leno. In 2008, she started her own YouTube channel, on which she began posting creative comedy videos. In the same year, her video entitled “My Push Up Bra Will Help Me Get My Man” was released which went viral on the internet; as of today, the video has been viewed for over 24 million times. This was a pivotal time in her career as a comedian, when her net worth began to rise exponentially. On her YouTube channel, GloZell posts videos about celebrity impersonations, song parodies and videos related to her daily life. Popularly, she translates the lyrics of popular songs in a comic way, the most famous being Rihanna’s song “Rude Boy”. GloZell was also one of the few YouTube personalities who has had a chance to interview the President of United States – Barack Obama – which was cast live on YouTube. She has also worked in collaboration with other popular YouTubers, including Coleen Balinger, Shay Mitchell, Marcus Butler and many others. Of course, being a popular internet personality has helped GloZell add to her net worth in the past eight years. She continues to be very popular on YouTube until today. Regarding her personal life, 44 year-old GloZell leads her life as a married woman as well as a mother. She has been married to her second husband Kevin Simon, her talent manager, since 2013; the couple recently had a daughter via surrogacy. GloZell was married to her first husband from 2000 until 2003. For now, GloZell resides in Los Angeles with her family where she is enjoying her life as a successful comedian while her net worth of $500,000 caters to her and her family’s daily lives. 1 Friends with Youtubers Colleen Ballinger & Frankie Grande [FrankGloCo].